There’s a risk of compromising quality when you’re doing rehabilitation in a recession, says Robbie Davison. His Can Cook venture is an inspiring example to the contrary. Aware that quality and innovation can go hand in hand to attract partnership and investment, he has made the third essential ingredient the skills of workers. The fact that staff are ex-offenders or people recovering from drug or alcohol problems becomes secondary to the fact that they become Can Cook franchisees, using their skills and experience to move into self-employment. This is no token rehabilitation but an investment by both parties – a true enterprise where each gives as good as it gets. It’s a valuable blueprint – and we need more. Learning from experience is often a two-way experience and we have been so lucky over the past six years to have had Dr Chris Ford as our columnist. 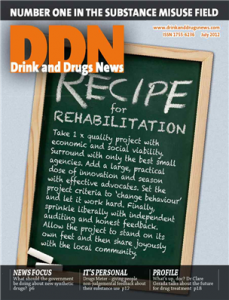 Not only has she become a valued friend of DDN and many of our readers, but she has shared insights from her own doctor-patient relationships that have taught us volumes about responsive treatment. The response I received from this reader was typical: ‘Every time you print an article from Dr Chris Ford, it really touches me in so many ways. I just feel she is one in a million in her understanding and dedication towards the field.’ We wish her happiness in her retirement. Tabloid hysteria, misinformation and a potential legislative minefield characterise the new generation of synthetic drugs. DDN reports. Can Cook is aiming to shake up the rehabilitation of ex-offenders and people with substance problems. David Gilliver speaks to its director, Robbie Davison. Drugs Meter allows people to get feedback on their drug use. Adam Winstock explains. Mary McMurran and Steve Delight explain about COVAID, an intervention for people prone to drink-related violence. Services are at risk of losing sight of their core purpose, says Chris Robin. Clare Gerada discusses what the future might hold for substance misuse services. For more than six years, Dr Chris Ford has shared her experiences in the surgery with DDN readers. This month she bids us goodbye.